The self-worth of a person is in direct correlation with the net worth of the company. If more managers and business owners would understand that, they would pay closer attention to how they communicate with their employees. There are so many people who never feel “good enough”. Unhealthy ways to measure your “worthiness” are comparing yourself to others, taking harsh criticism too much to heart, your appearance, your income and material possessions. Many people, especially men, define their worth by their career. Your self-worth shouldn’t never be tied to your job title. Your job title shows what you do but not who you are as a person. You choose the way you feel about yourself. Nobody else does. 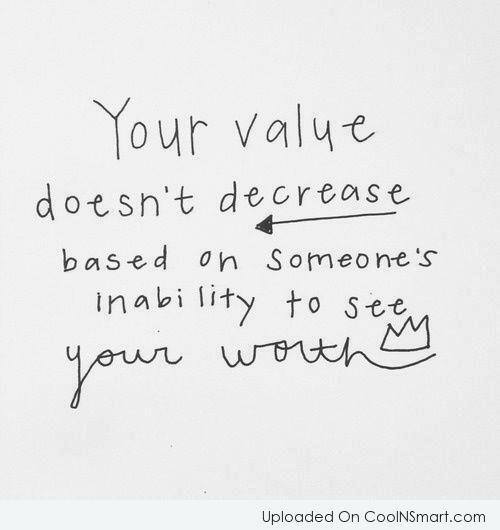 You determine your worth, not other people. Be observant of your inner dialogue – what are you telling yourself about yourself? Your brain is like a computer and the input is your choice. Establish pride for your contribution at home and at work. Keep learning new things every day – this definitely increases your value. Focus on what is within your control – your attitude is. Smile – smile a lot. Love yourself – nobody is perfect. If you stop to measure your self-worth by the opinion of others, it will positively impact the quality of your life.